Watercolors on Lake Helen in Lassen Volcanic National Park, California, USA. My May-print is also the starting signal for the new watercolor theme, which I will present with many more photographs in the future. 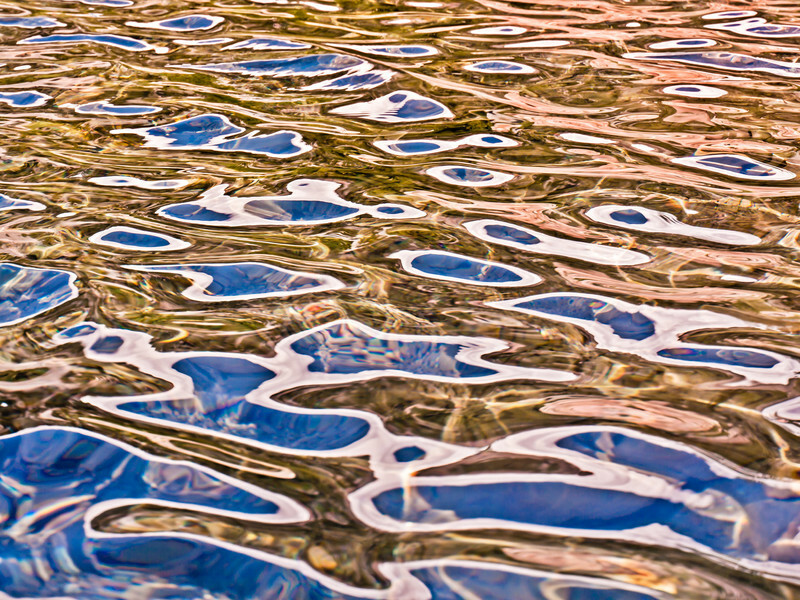 Since several years I try to create photographs of amazing colors and patterns on the surfaces of lakes, rivers, and the sea. Although somewhat similar to the carcolor compositions, these watercolor reflections are much more complex. Instead of a rigid, reflective car body, here the "mirror" is a wavy and wobbly liquid. Depending on the frequency and pattern of the waves and riddles, the reflections change dramatically. These photographs thus have a certain random element and each capture is truly unique. However, observing a body of water for a while will reveal recurring patterns and over time I have learned to predict and pre-visualize compositions that I find interesting. The photograph above, which I have printed as my monthly print for May, shows fantastic cloud and sky reflections on the surface of Lake Helen in Lassen Volcanic National Park. Brownish-reddish volcanic rock, green trees, and spicy waves transform this otherwise ordinary water reflection into something unexpected - at least in my opinion. By the way: the waves were partly created by me because I was wading in the refreshing water in order to create this photograph and the photograph would also fit the tilt-(shift)-theme.